According to a new report by LGBT legal advocacy group Lambda Legal, nearly one-third of Donald Trump’s judicial nominees are overtly hostile towards LGBT rights, and if confirmed, could curb workplace protections, healthcare access, equal protections in public spaces, voting rights, and several other protections for LGBT people for generations to come. Lamda Legal analyzed the legal records, writings, and additional public comments from Trump’s 59 nominees and publicly opposes 16 who have “explicitly” denigrated or failed to recognize the rights of LGBT people and their families. 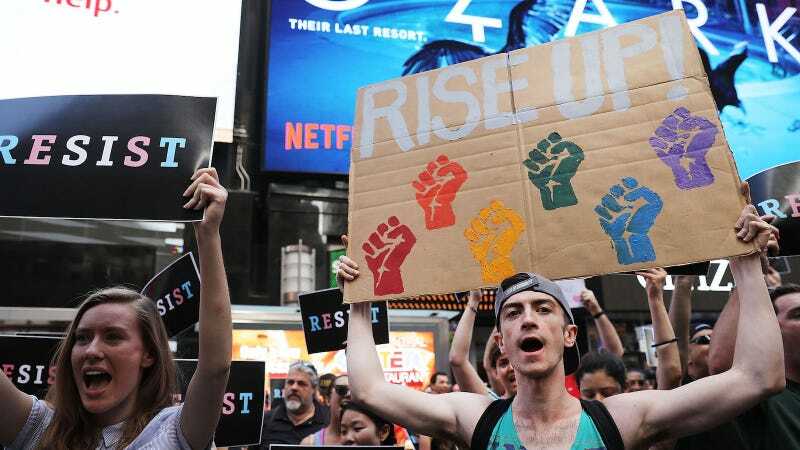 However, as McGowan explained, “the body of law that LGBT people rely on is obviously not exclusive to LGBT people,” noting that it’s connected to laws about religious freedom, reproductive rights, and civil rights. Yuvraj Joshi, Fair Courts Project Fellow at Lambda Legal, added that the statistic is “probably an underestimate,” noting that the organization has raised concerns about several other nominees who have ties to anti-LGBT groups. Additionally, “many of the two thirds have troubling civil rights records, even if that record does not explicitly talk about LGBT people,” he said. “This burden of these homophobic and transphobic judges is really going to be hitting the people who need the protections of the federal court the most,” said McGowan. Citing the 5th Circuit as an example, which includes sates like Louisiana and Mississippi, she said, “These are places that disproportionately lack any kind of state employment protection, where people are less likely to be living above the poverty line, where people are not able to access food or healthcare or medical care, and so the fact that these courts are being packed with anti-LGBT nominees is largely because the senators from those home states are complicit in advancing the anti-LGBT agenda.” Lambda Legal hopes that Democrats and concerned citizens will pressure the Senate to slow the confirmation process and vote against the anti-LGBT nominees. While the Supreme Court is the most powerful court in the country, it only hears a handful of cases compared to federal courts, which have the power to interpret the constitution and therefore heavily influence policy at the state, local, and federal level. In the first year of his presidency, Trump has made 59 nominations to fill more than 120 inherited federal judge vacancies (Obama inherited only 54). The Senate has confirmed his picks at a pace more rapid than under the Obama and Bush administration, with 18 nominees confirmed in the first year. If this trend continues, Trump will succeed in reshaping the federal courts into his image.